Sarah Nader - snader@shawmedia.com Alex Schrempf (left), 12, of Crystal Lake and chef Ingo Betz of Crystal Lake teach students at the Spring Break Kids Culinary Boot Camp how to prepare potato pancakes during class in the Donna and Joe Vestal Culinary Studio at Lakeside in Crystal Lake on Tuesday, March 27, 2012. Schrempf co-created this stay-cation activity and helped the students prepare recipes from many cultures including Mexican, Asian, Eastern European, Italian and American cuisines. Sarah Nader - snader@shawmedia.com Olivia Ott (right), 11, of Crystal Lake and Olivia Sheasbt, 11, of Crystal Lake grate potatoes for potato pancakes during European day at the Spring Break Kids Culinary Boot Camp in the Donna and Joe Vestal Culinary Studio at Lakeside in Crystal Lake on Tuesday, March 27, 2012. 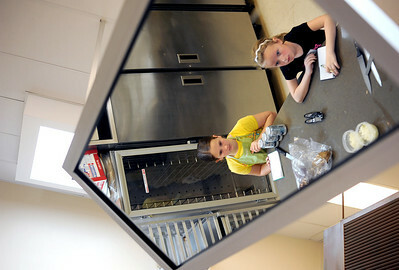 Sarah Nader - snader@shawmedia.com Olivia Sheasby (left), 11, of Crystal Lake and Anna Gilmour, 9, of McHenry listen to the chef explain an apple sauce recipe during European day at the Spring Break Kids Culinary Boot Camp in the Donna and Joe Vestal Culinary Studio at Lakeside in Crystal Lake on Tuesday, March 27, 2012. The campers learn about nutrition, kitchen tools, safety and how to prepare all sorts of recipes. 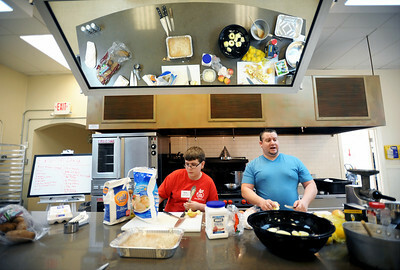 Alex Schrempf (left), 12, of Crystal Lake and chef Ingo Betz of Crystal Lake teach students at the Spring Break Kids Culinary Boot Camp how to prepare potato pancakes during class in the Donna and Joe Vestal Culinary Studio at Lakeside in Crystal Lake on Tuesday, March 27, 2012. Schrempf co-created this stay-cation activity and helped the students prepare recipes from many cultures including Mexican, Asian, Eastern European, Italian and American cuisines.